Who had a very neat vanishing trick up its sleeve. Now you see me, now you don’t. I might be a bit slow on the uptake, but it wasn’t until recently I realised that some butterflies over winter, I assumed that they emerged from their chrysalis in the spring. well its actually turned into a kind of archaeological dig, so much stuff! It was during this process, we found lots of hibernating butterfly tucked away behind old cupboards and pieces of timber, sadly I also found a lot of dismembered wings! I suppose a spider needs to eat. Categories: Derbyshire, Found objects, Insects, Nature, Photography, Wildlife | Permalink. Mr Uphilldowndale and I were amused by the following sign. 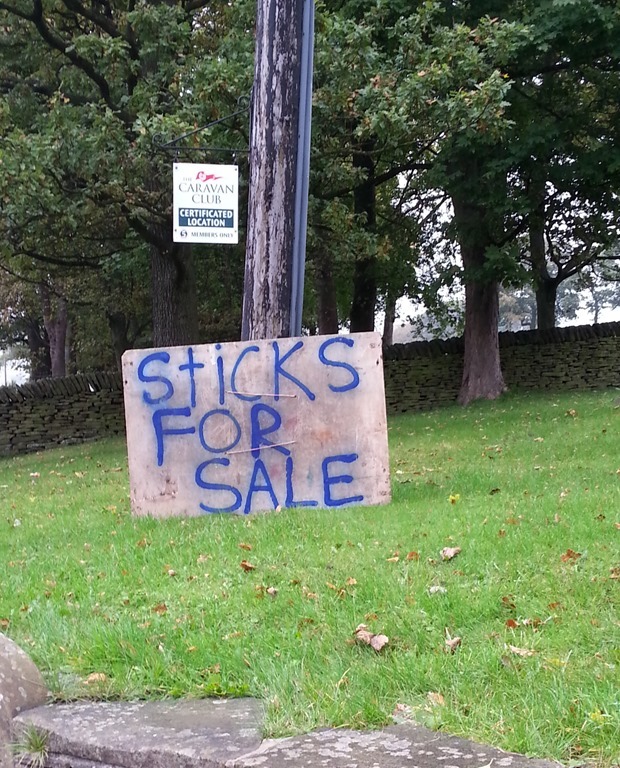 You often see logs for sale, and occasionally Kindling, but never sticks, it’s obviously a gap in the market someone has decided to plug. I wonder how big a stick has to be to be classified as a log, or for that matter how small does a stick have to be, to be a twig. Categories: Found objects, Travel, Trees | Permalink. 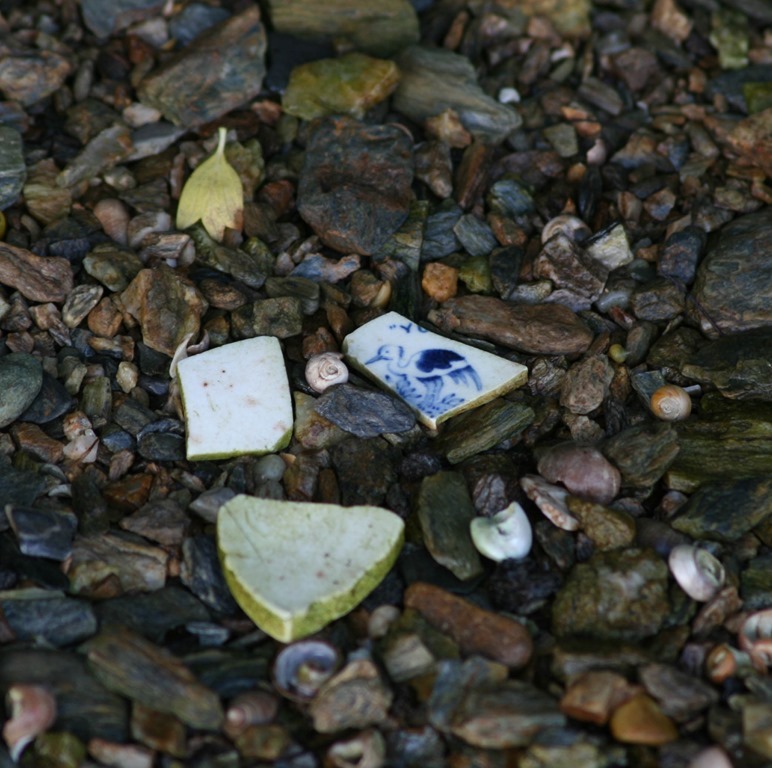 When in Devon,Mrs Ogg and I went mud larking, I’ve a fondness for finding bits of pottery, and down on the foreshore of the Salcombe estuary I’d found a quiet spot where there was plenty. I think there must have been an old bottle dump nearby, that’s now giving up its treasures to the waves. 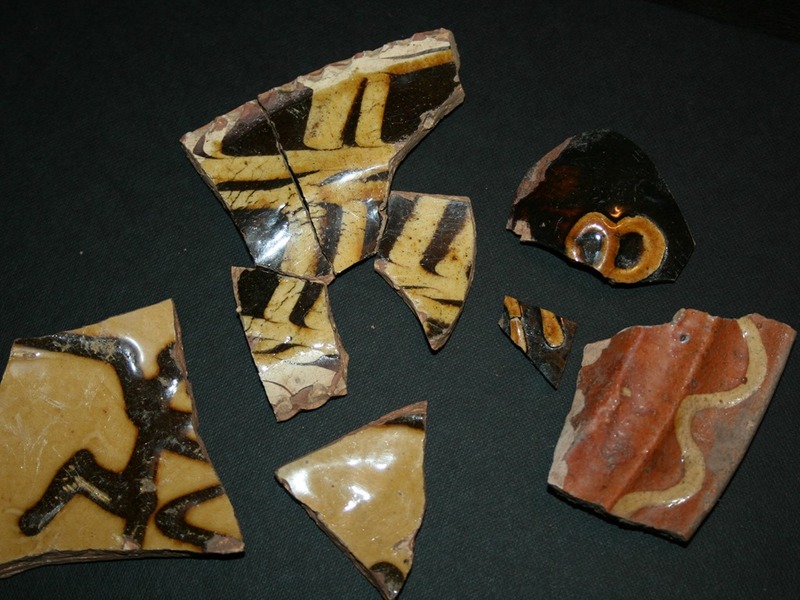 It took a little while to get your eye in, broken pottery tends to look very much like broken sea shells. 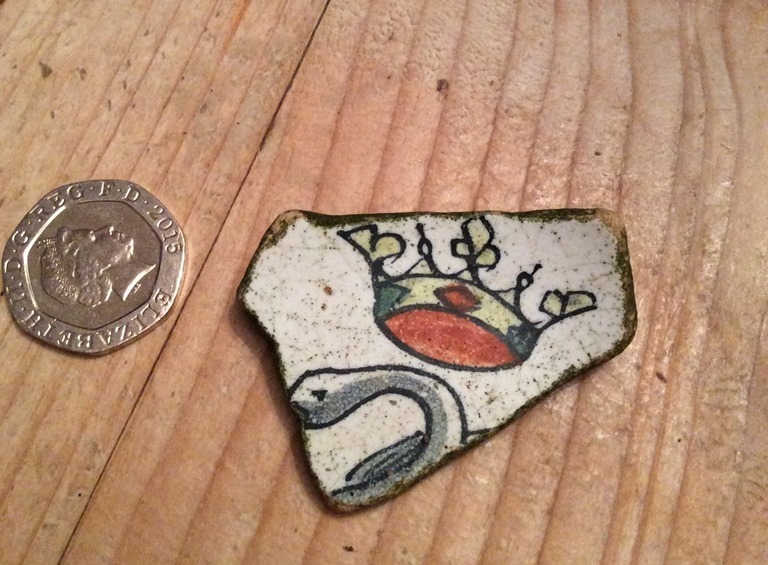 I think Mrs Ogg had the best find of the day, I thought it looked like it might Gothic Revival style what do you think? So what will we do with our treasure trove? 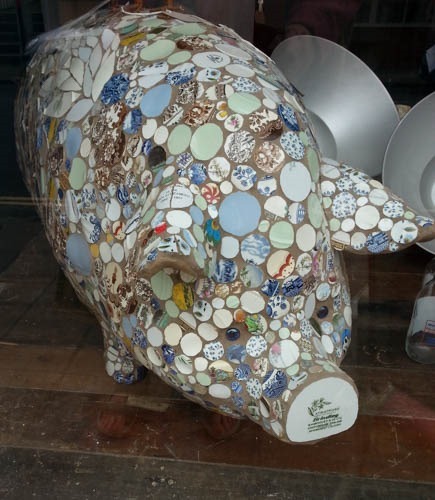 Earlier in the day I’d seen a rather inspiring piece of recycled ceramics. Mr Ogg thought we should cut out the mud and just buy it. I don’t think he quiet realised it was pretty much life size (and pigs, in my experience, are always bigger than you think they are going to be). But maybe Mrs Ogg and I should set the bar a little higher? 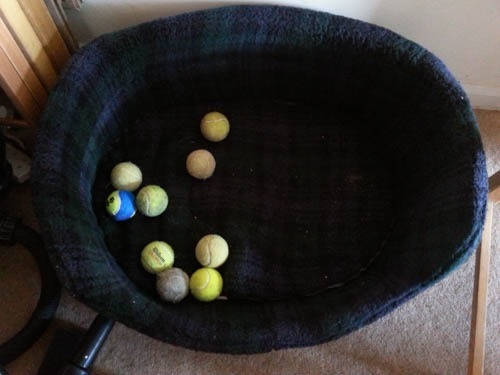 We weren’t the only ones to find treasure on the beach, Spud the dog returned home from his holidays with nine more tennis balls than he started with (and we know how much he loves tennis balls ) he made a nest of them in his bed. Happy dog. Categories: Devon, Dogs, Found objects, History | Permalink. 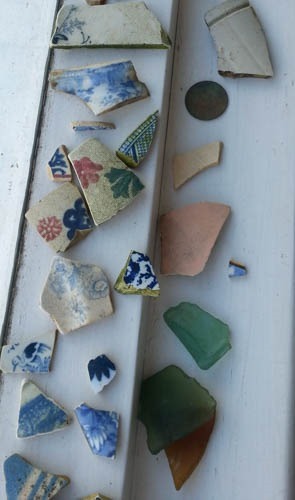 Whilst most of it has been Victorian blue and white pottery plus quite a lot of earthenware; some pieces stood, out as looking earlier. I did a bit of rummaging around (AKA research)and found this delightful blog (which is sadly ‘resting’ as it is full of fascinating posts to be enjoyed) which would suggest it is indeed from the 17th or 18th century. If I see our local museum is having a finds day, I’ll take them along and see what I can find out (they do write an interesting blog). I’ve mentioned before that it is quite tricky to know just how old our house is. 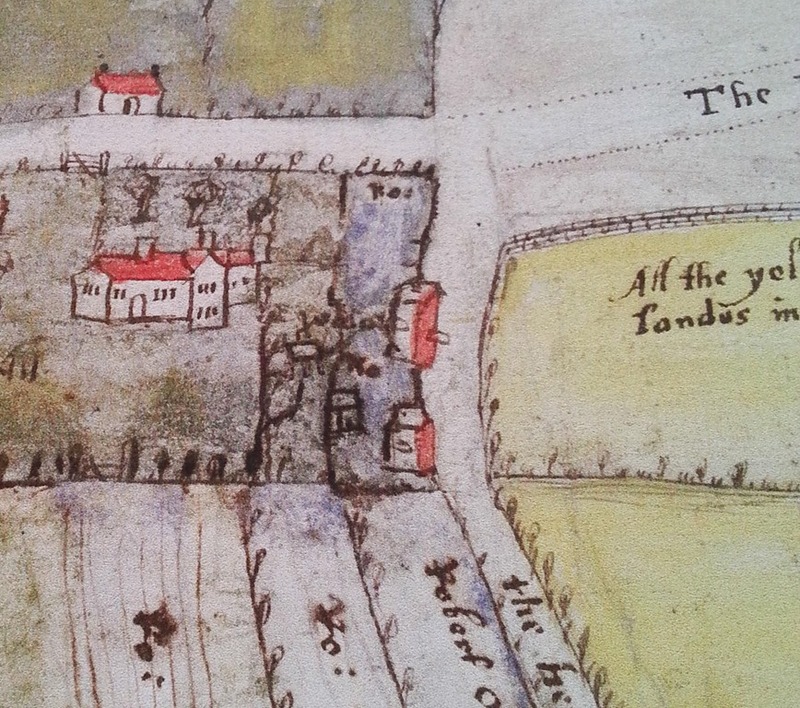 However a neighbour made a chance discovery, that a map of this area, from 1606 (yes sixteen hundred and six) rests in the National Archives at Kew. He ordered a copy. It is delightful. I was so excited to see it, it was far more decorative and detailed than I imagined. The detail, the trees, the gates and the fields (the boundaries of which we can still recognise) are carefully included. 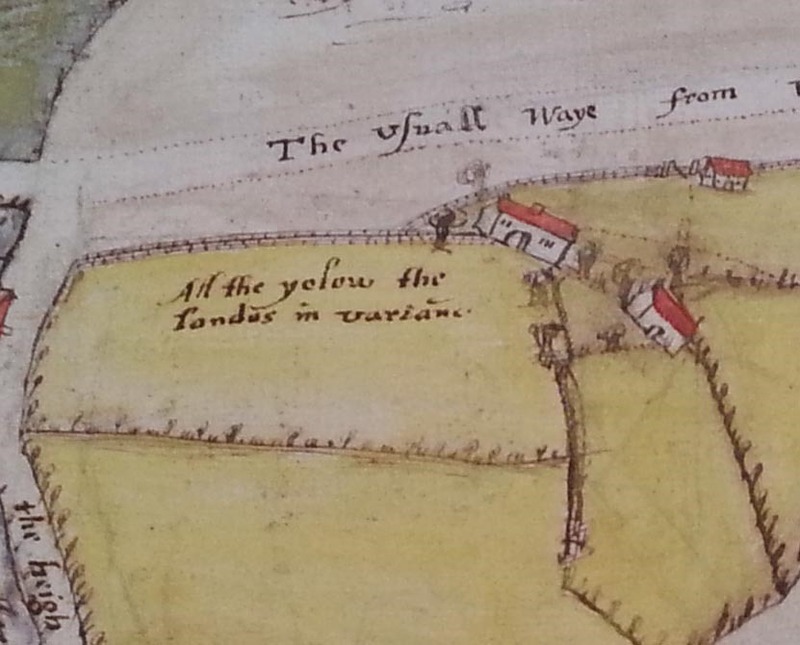 We can’t be sure our house is represented, as some of the detail doesn’t quite match up, but there were certainly homesteads nearby at that time. Maybe that is where the pottery out of ‘trench one’ came from. Who knows? I think maps from this time must be quite scarce , apparently that this one survives results from the area, albeit in Derbyshire being part of the Duchy of Lancaster, the map was drawn up in a land dispute, and forms part of their archives. It has certainly whetted my appetite to try and find out more, when the dust settles. Categories: Derbyshire, Found objects, History | Permalink. Lilies do not need gilding, nor do orchids really. 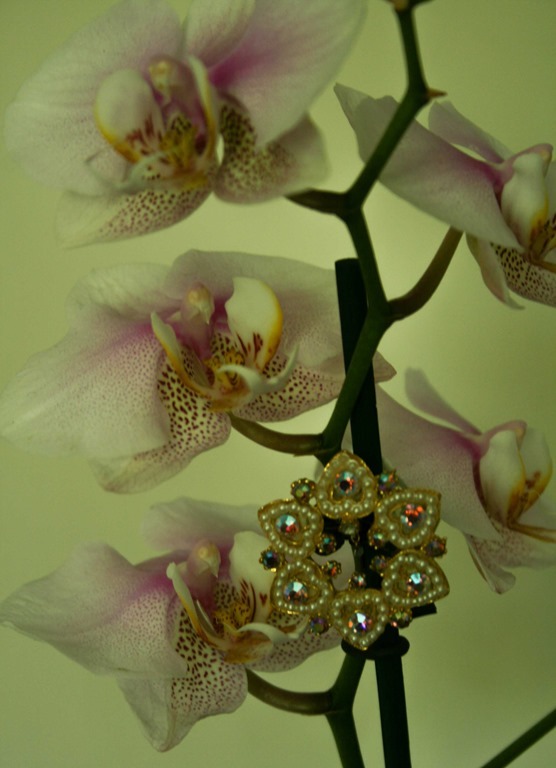 But I couldn’t quite stop myself from adding this art deco brooch to an orchid plant. The colours are just magnetically drawn to one another. I‘ve spent the afternoon, surrounded by magazines and scraps of paper and glue, in an arty collage workshop event, I had a lovely time. I do need to play out more,things have been far too serious of late. I need to feed my soul. I’m told it is my blogs seventh birthday today, my blog would like me to play out more too. Categories: Art, Flowers, Found objects | Permalink. 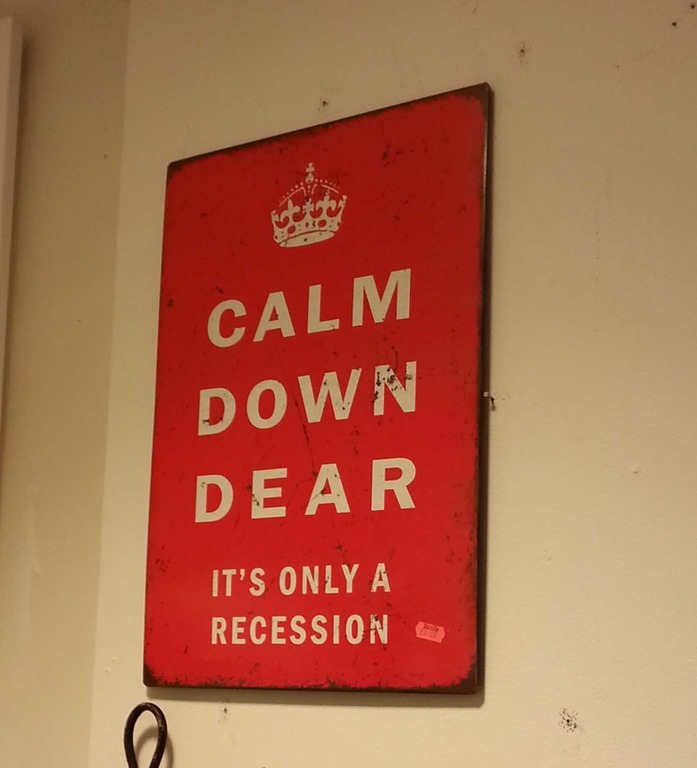 Look, it must be, I took Mr Uphildowndale to the store in York, where I’d seen signs that the recession was deepening. 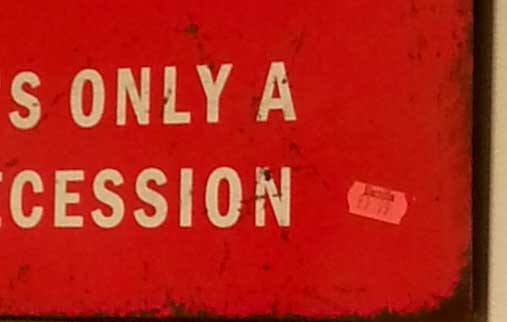 Ahhh, but wait, it’s not actually sold yet has it? Maybe we shouldn’t count our Easter chicks before they’ve hatched. On entering Barnitts I thought I was going into a small shop selling light fittings (I’m always trying to source light fitting I like, I’ve not managed it yet) to my amazement, it was like entering, Narnia I found myself in a warren of departments, all on different floors and levels I emerged an hour later from a door way two shops down from where I’d gone in! I discovered many shops are like this in York, the result of trying to squeeze modern shopping fashions into a historic city of jumbled buildings. If you wanted to buy a new tea pot, Barnitts will have 20 to chose from, a flask to keep the tea warm? dozens.’ Letter boxes? 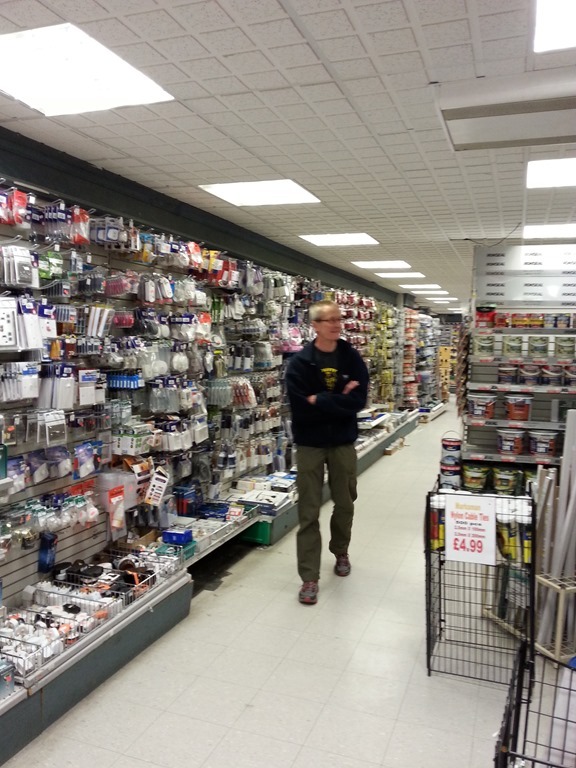 Did you want brass or wrought iron? and a door knocker to match? I can’t imagine what it must be like to stock take, but I do know the total stock value must be massive! 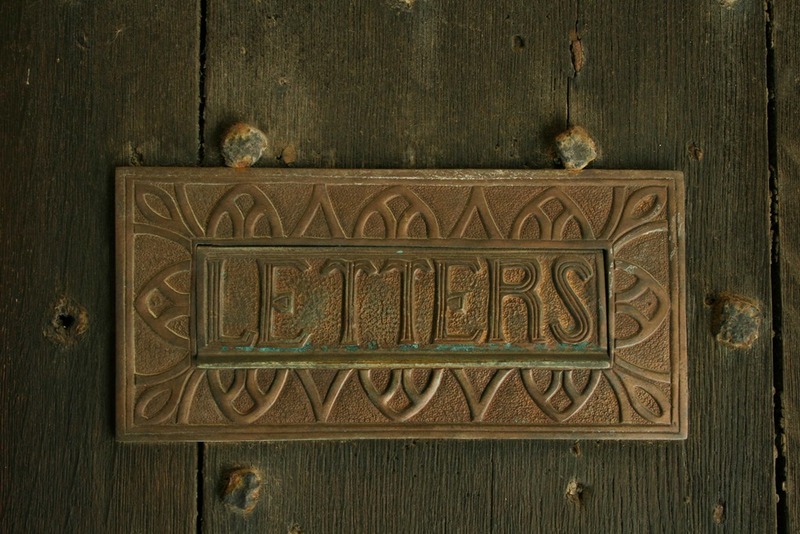 This letter box is in a door at York Minster, not Barnitts, but I’m rather taken by it. Categories: Away Days, Found objects, History, Yorkshire | Permalink.